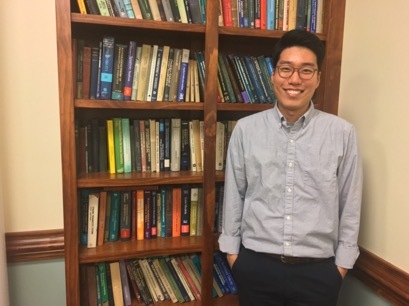 Doctoral student Chul Moon applied his statistical training and knowledge to real-world data through his internship with the National Science Foundation’s (NSF) Mathematical Sciences Graduate Internship (MSGI) Program. Chul Moon has long recognized the importance of interdisciplinary research. Moon began his career in STEM (science, technology, engineering and math) with an undergraduate degree in industrial engineering and mathematics. When Moon decided to pursue his master’s degree in economics, he realized that many economic claims were based strongly in mathematics and statistics. This realization inspired him to pursue further studies in STEM. Now he is a doctoral student in statistics at the University of Georgia. Recently, Moon collaborated across disciplines in a way he never expected. He combined mathematics and geology during an internship with the National Science Foundation’s (NSF) Mathematical Sciences Graduate Internship (MSGI) Program. Moon’s doctoral thesis is focused on topological data analysis, which is the study of the shape and structure of data. The subject is a relatively new research area in statistics; therefore, Moon was eager to collaborate with other researchers and apply his statistical methods and theories to real-world data sets. The NSF MSGI Program was the perfect opportunity for Moon. The program provides research opportunities for mathematical sciences doctoral students to participate in internships at national laboratories, industries and other facilities. NSF MSGI seeks to provide hands-on experience for the use of mathematics in a nonacademic setting. Assigned to Sandia National Laboratories in Albuquerque, New Mexico, Moon collaborated with a team of geoscientists and mathematicians to analyze rock formations and their topological characteristics. Rock formations are a prime subject of study for petroleum extraction, mining and hydrology. Geologists need to gain knowledge about the surface of rock formations and also what lies beneath the surfaces. To discover what types of resources may exist and where they are located in formations, geologists must recognize what kinds of rocks are present, where the strata begins and ends, and the structure of the rocks. The more that is known about the formations, the more successful drilling and resource extraction will be. Under the guidance of his mentor, Scott Mitchell, Ph.D., Moon sought to create an analytical framework for rocks using topographical data analysis that considers grain structures, pore structures, shape and connectivity. These rock characteristics determine what kind of natural resource exists and how much of it is encased in the rock. Examples are natural gas in shale or aquifers in sandstone. Moon’s analytical framework for rocks integrates topology to make it more efficient and ultimately less costly for geologists to sample and analyze structures. Moon proposed a method to determine the smallest sampling size needed to successfully analyze the rock formations of interest, and he developed a classification system for rocks based on their structure. To accomplish these tasks, he used topological data analysis to help define characteristics for each rock unit and convert the characteristics into numeric values so that they can be used in a statistical model. In layman’s terms, the model uses data from above the ground to paint a picture of what might exist beneath the surface, including the characteristics of each rock unit. The model provides a small taste of what topological analysis can reveal about the rocks below. Moon presented his findings with his colleagues at the American Geophysical Union Fall Meeting in New Orleans in 2017. They are preparing a manuscript for publication. Moon plans on completing his doctoral degree in 2018, and following his graduation, he hopes to pursue a career in academia. The NSF MSGI Program is funded by NSF and administered through the U.S. Department of Energy’s (DOE) Oak Ridge Institute for Science and Education (ORISE). ORISE is managed for DOE by ORAU.